In their youth, they were just two strangers on the same journey; teenaged boys seeking their independence and a new life, two loners in a crowd of many hundreds of other strangers also taking that very trip. The mass Exodus. The ship they boarded, Exodus 1947, carried Jewish emigrants from France on July 11, 1947, and headed to the British mandate of Palestine. 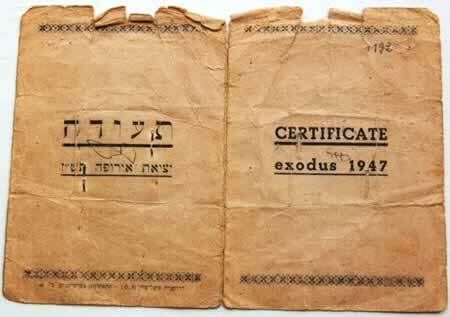 Most of the emigrants were Holocaust survivor refugees with no legal immigration certificates to Palestine. When the British Royal Navy seized the ship, passengers were deported back to Europe. Now, more than six decades later, on Israeli Independence day no less, these two veterans of the War of Independence for Israel learn of each other's existence; amazingly, they live a few hundred yards apart on the Menorah Park Campus, and are meeting for the first time, for lunch. Seated together in the corner of the Stone Gardens dining room, Oscar Saks, Stone Gardens resident for less than a year, and George Adler, Menorah Park Campus resident for eight years, are introduced. 'Oscar, meet George. George, meet Oscar.' They smile and nod at each other. Oscar, who knows six languages, is soft spoken. George is a bit hard of hearing. He and George both have accents that reveal their heritage, but the conversation becomes easier to understand as each man's story unfolds. Oscar was 17 when he came from France to board the ship. George came from a boy's camp in Germany. He was just 15. George asks Oscar if he took a train to the ship. Oscar doesn't recall. He asks George how long he was on the ship. George tells him he was on the Exodus for seven days, then spent three weeks in the cargo hold on a British ship that intercepted. George recalls being sprayed with DDT, a poison. 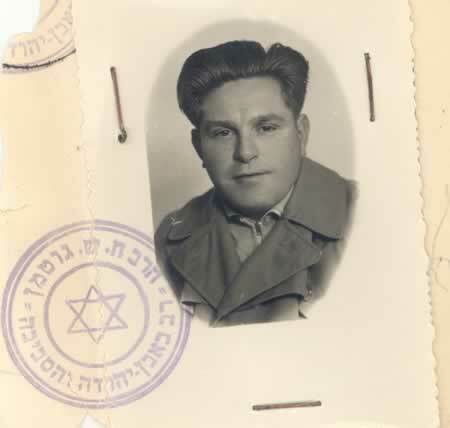 He remembers the final day on the British ship when the British soldiers demanded the Jewish passengers exit the ship. When they refused, the soldiers filled their space below with cold water, perhaps with the intention of drowning them all. As the water level reached chest-high, the passengers relented and left the ship. "There was nothing else we could do," George remembers. "So we got off." He then added, "But, we hid bombs in the ship so it would blow up after we got off." Oscar recalls the conditions were not as bad on the ship that he was on for two weeks, the Liberty, which he said was loaned to the British by America. On the table in front of each man are photocopies that reveal facts and historical pictures from the Exodus. Neither man is in those snapshots of history, but the grainy black and white pictures reveal so much; a mother and daughter walking down the ramp, a pale young man smoking a cigarette on the deck, families separated after one last goodbye, weary passengers near journey's end, staring out into the waves for a sign of having arrived. George picks up the pages and touches one of the pictures, quiet, as if recalling the more intricate details of his journey. Oscar says he believes the Exodus 1947 eventually burned. History confirms that it remained moored to a breakwater at Haifa harbor as a derelict until it burned to the water-line in August 1952. In 1963, it was scrapped. By the time his lunch arrives, each man has a mutual understanding and respect for what the other went through so long ago. Relaxed by the aroma of hot soup, tender pot roast, asparagus, rolls and mashed potatoes, they continue to talk, realizing they had more in common. They laughed when each revealed he had thrown potatoes at the British soldiers who approached to force their ship to turn around. Oscar confesses he threw cans of sardines too. 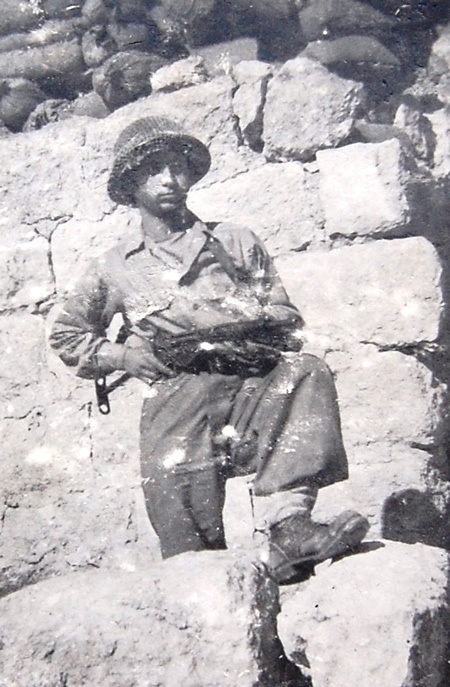 They said they had no regrets when each volunteered to fight in the Israeli war for Independence. Oscar operated a machine gun, George was a foot soldier. "They needed everybody at that time," George recalls. "I think about it," Oscar adds, "but not that often." After the war, both men came to the U.S., each on his own different life path. Oscar worked at his Advanced Auto Transmission repair shop, George worked at a heating and air conditioning shop, then later, delivered dentures for a dentist. Both men were located within miles of each other in their adult lives, but never met. Not until this 64th anniversary of Israeli Independence Day. As they slowly enjoy their lunch, Oscar tells George how he met his wife of 49 years; about his two kids, how he worked hard, and had a happy life. George tells him that he remained a bachelor, to which Oscar suggests he can meet a good woman at the Jewish Community Center, where he met his. As lunch dishes are cleared, the two make their way into the chat room to bask in the warmth of the fireplace. They continue their conversation, realizing before they say goodbye, they are neighbors, residents of the same campus, and at anytime, at will, they can meet again with just a phone call or a short walk through a hallway or two. 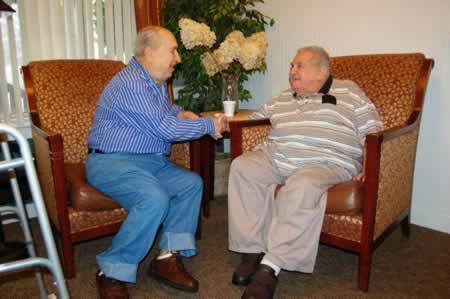 George wants to reciprocate and the two even discuss inviting others; seeing their smiles, anyone can tell they are no longer strangers with stories untold - but two men form a time in history when even if they had crossed paths so many years ago, would never have imagined they would someday be destined to meet as residents of the same senior campus; Menorah Park Center for Senior Living.